You have a house full of holiday visitors and just one question: What do I do with them? Easy. Take ‘em on a hike! 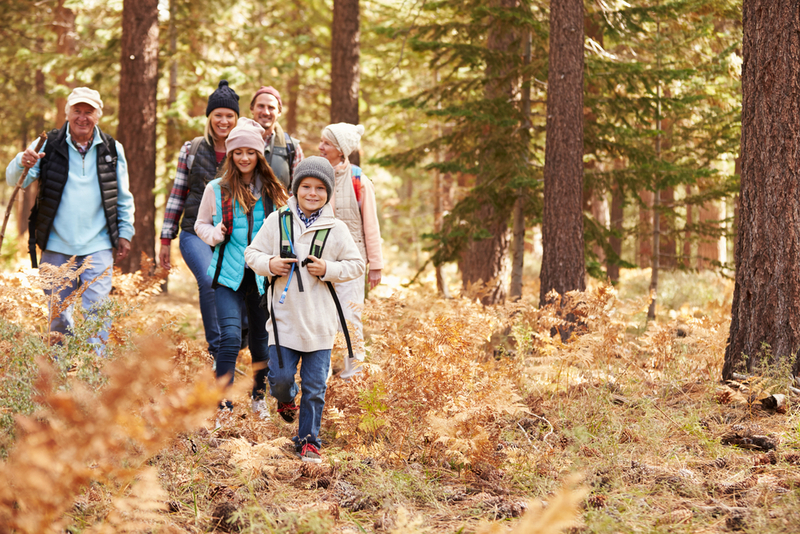 A hike will do all of you good: it’ll keep everyone busy and occupied, it gets everyone out of the house, it makes everyone less cranky, and you can get a jump on your 2018 resolution to move more. We’ve identified a couple of hikes near you that are ideal for anyone, but especially folks who like the idea of moving, but maybe haven’t done a lot of it lately. We give you a quick description, then direct you to where you can find more information, including how to get there. Mountains-to-Sea Trail, Folk Art Center: 2.2 miles. Intrigue your visitors with tales of a trail that spans the length of North Carolina (1,175 miles! ), then take them for a sample. This stretch begins at the Folk Art Center (allow time for a visit) and heads east to where the trail crosses the Blue Ridge Parkway, then return. A nice stretch of hardwood forest, an easy-to-follow trail. Details here. Bent Creek Experimental Forest, Rice Pinnacle Road: 1.6 miles (one way). Some folks need to ease into hiking: a good way to do that is on wide double track trail, such as the Rice Pinnacle Road. Easy access and with an average grade of 3 percent, pretty mellow hiking. Details here. Evergreen Nature Preserve: 2 miles. Mecklenburg County’s 16 nature preserves offer wonderfully quick escapes wonderfully close to home. Hardwood forest, a couple of small creeks, two glades — it’s got a lot in just 77 acres. Details here. Latta Plantation Nature Preserve: 4.2 miles. A highlight here is hiking into the past through a restored Piedmont prairie much like the prairie that covered a surprising amount of the region before the European visitation. You also get a view of Mountain Island Lake. Details here. Osprey Trail, Lake Townsend, Greensboro: 2.3 miles. More than 40 miles of hiking trail surround Greensboro’s three watershed lakes, most offering great strolls along the shoreline. The Osprey Trail is a favorite, in part because it tends to be one of the least visited. Details here. Sal’s Branch Trail, Umstead State Park, Raleigh: 2.8 miles. This hike begins and ends at the Visitor Center (restrooms! ); in between, it rides over gentle slopes, visiting Big Lake, and passing through stretches of mature hardwoods. An especially good option for the reluctant. Details here. Occoneechee Mountain Loop Trail, Occoneechee Mountain State Natural Area, Hillsborough: 2.2 miles. Conquer the highest peak in the region (867 feet) while also experiencing some Southern Appalachian flora, located, curiously, on the lowest part of the trail, where several montane plant species, including galaxy, grace the slopes. Details here. Basin Trail, Fort Fisher State Recreation Area, Kure Beach (Wilmington area). 2.2 miles. An easy hike through flat marshland that passes a WWII bunker (once the home of the Fort Fisher Hermit) and ends at an observation deck ideal for bird watching. Details here. Goose Creek State Park loop, Washington. 2.2 miles. With 7 miles of total trail, you have options at this swampy park on the banks of the Pamlico River. One is to take Main Road to road’s end, park, then loop together with Mallard Creek, Huckleberry and Live Oak loops for great views of Mallard Creek and the Pamlico River. Details here.